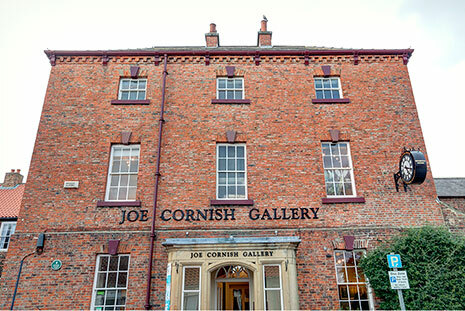 The Joe Cornish Gallery has been located in the North Yorkshire county town of Northallerton since 2004. Built in 1736 to house the North Riding of Yorkshire Registry of Deeds, Register House is full of all the alcoves, nooks and crannies that you would expect of a building of the period. Set over two floors, Joe and his team have married the character of the building with a warm and welcoming feel and a desire to make the gallery and the art as accesible as possible. The gallery staff understand that buying art is a personal experience and are on hand to offer all the assistance and advice you may require. We are also members of Own Art, the Arts Council England Initiative which provides an interest free purchase scheme to make buying art, simple and affordable. The gallery holds a permanent exhibition of Joe's work as well as his print archive. After undertaking a long printing apprenticeship, Joe now handprints each photograph in his North Yorkshire studio. Printed from very high-resolution files and onto the latest matt papers to ensure the highest quality, they are then mounted with conservation grade, acid free board. Prints come in varying degrees of limited edition and are priced accordingly. In addition to Joe's work, the gallery also exhibits work by other photographers, artists and craftspeople ias well as hosting regular craft and photographic workshops and cultural events. Joe is keen to promote the cause of the community of nature photographers and to that end the gallery reflects a broad spectrum of work and provides a shop window for new and upcoming talent. The gallery's standing as a destination as much as an exhibition space is enhanced by a cafe serving locally sourced and freshly made food. A gallery shop selling prints, cards and work by local artists, designers and craftspeople completes the layout of the gallery building.